When it comes to managing business expenses, half the battle is keeping tabs on your business mileage. Obviously there are plenty of apps that let you manually enter your miles or odometer readings—but that’s still a pretty low-tech approach. But, hey, your smartphone has a built-in GPS, right? 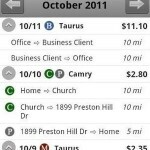 Seems like a smart app could leverage that to automatically keep tabs on business mileage. That’s TripLog GPS Business Mileage Tracker in a nutshell. Available for Android and iOS, this app monitors your business mileage via GPS, tracks any parking, tolls, or other expenses, records fuel costs, and generates IRS-ready reports. All you do is set up your vehicle, then take a few seconds to create a new trip before you head out on the road. TripLog will automatically pinpoint your starting location, though you can enter a different location if needed. nature of the trip (business, charity, medical, etc. ), entering notes, and adding any applicable parking or toll costs. TripLog can also calculate fuel economy, manage multiple vehicles and business entities, and support commercial trucks. It leverages 2012 and 2013 IRS data to determine business mileage rates. Best of all, the app can email IRS-compliant, tax return-ready business mileage reports in CSV or HTML format. Actually, at the moment only the Android version can do that it; it’s coming soon for iOS. In fact, the vastly superior Android version also lets you snap photos of your expense receipts. It offers one-tap start/stop via a Home Screen widget, and can even be set to auto-start business mileage tracking. TripLog is not only free, but also ad-free. However, you’ll want to check the developer’s pricing page for information on some premium options, like a reasonable 99-cent charge for a single-year report or $4.99 for unlimited reports, receipt photos, and the like. Android users should definitely check this out. The iOS crowd may want to wait at least until business mileage reporting is enabled, as the app isn’t much use without it. Have you found a business mileage tracking app you like better? Tell me about it in the comments.